In our work as parents, we strive for an ideal. We know how we want our parenting to look: joyful connection with our children, preparation of healthy meals, living in a clean and beautiful environment, reading and playing together, gently supporting our children in times of need. As these tasks become impossibly difficult, we push and struggle and wonder why we can’t make it work. We beat ourselves up, blame situations or people or our history or situation. I don’t want to play with my children. There’s nothing I want more than time away from the kids. I’m angry that he doesn’t talk. I hate that she’s not potty trained. Astute parents try to shift out of these feelings by feeling gratitude for the things they do like about their children, situations and themselves. Gratitude is a lovely practice, but faking it isn’t gratitude. It becomes another should (I should be grateful for my children. Why aren’t I?) The idea that we should be grateful becomes another reason for guilt and sorrow. Even though I don’t want to play with my children, I can love myself anyway. Even though I want to get away from my children, I am a good enough mother. Even though I hate things about my child, I can consider forgiving myself. The purpose of the tapping exercise is not to cheer up, but to love, accept and forgive yourself no matter what. If you tapping on these phrases – or even just say them – you may be surprised one day to discover that you really do accept yourself as you are. Perhaps you will then be even more astonished that the ways and means for more satisfactory parenting and living show up for you. 2. Soften your belly and breathe. 3. Lay on the couch for five minutes. Put an eye pillow scented with lavender on your eyes. 4. Have self-mercy and awareness in scared times. 5. Go outside. Walk. Dig. Lay on the Earth. 6. Gaze into the distance. Look up and out for a few minutes. See the big picture. Several of the Getting There suggestions were inspired by Jennifer Louden’s words during an interview with Pace Smith. I highly recommend reading Jennifer Louden’s The Life Organizer: A Woman’s Guide to a Mindful Year and joining the Connection Revolution. The first homeopathic remedy I used was Hyland’s Teething Tablets. They offered my teething baby instant relief and I was duly impressed. I purchased them because I had read that these remedies were extremely safe for my baby. Then, I became intrigued. How did homeopathy work? What were these pellets? 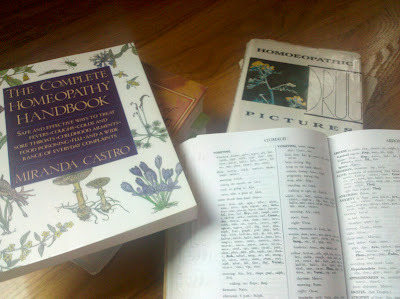 I bought a few books and began reading about homeopathy. Soon, I was interested enough to enroll in an Introduction to Homeopathy class at the local community college. My teacher, Dr. Gregory Kruszewski DHMS, RN, CCH, RSHom, was a classically trained homeopath. He obviously loved his subject and knew it well. Treat the patient, not the disease. Give only the minimum dose. I researched what homeopaths recommended and bought a small home remedy kit. I began using homeopathy very successfully — but very sparingly. All of the books I read warned not to give the remedies too often, not to give too many remedies, not to use high potencies. This could lead to “proving” the remedy (developing the very symptoms the remedy was intended to treat) or could change the person’s constitutional picture, making future treatment difficult. I started to become afraid. The more I learned, the more I used homeopathy — but always with an eye to not err or harm my children in some mysterious way. I have always been a rule follower. This made me very popular with teachers and served me well in many situations. Eventually though, I realized that following all of the rules was detrimental to growth and expansion. By the time I enrolled in the homeopathy program at the Institute of Natural Health Sciences (INHS), I had a reasonably good grasp on homeopathy. Enough that I was pretty scared to use it the way I felt drawn to use it. At the INHS, a whole new world opened for me. The head instructor, Dr. Kenneth S. Pittaway, ND, PhD, urged us to use the remedies. He prescribed high potencies as often as low ones. I watched him switch remedies often, as the patients healed and changed. My classmates, some of whom were completely new to homeopathy, jumped in with both feet. I watched in awe (and dismay) as they ordered remedies and began administering them for themselves and friends. I was certain that disastrous ramifications would develop: constitutional pictures would be forever affected, mystery symptoms would appear. None of this happened. After taking the remedies, most people felt better. There were no ill-effects. Slowly, gently, I too began to use remedies with more confidence and more frequently. Suddenly, my reading and listening was revealing that Samuel Hahnemann (the founder of homeopathy) saw his patients frequently and changed remedies constantly. I realized that if one of the greatest healers of all times worked this way, I could learn from his example. As my perspective of what is right and wrong in homeopathy shifted, I discovered that the best way to learn was to use the remedies and to trust my own experience. I learned that homeopaths all over the world help people using endless variations of what I initially thought was one right way to practice homeopathy. This is why I write these blogs and share with you how to use remedies to help yourself and your children. I believe that homeopathy and cell salts are real health care reform. Using them (and other natural health tools) empowers individuals to take charge of their own health. I hope that you are reading the homeopathy and cell salts articles. If you read something and think, “That’s just like my kid! He has those exact issues,” please buy the remedy and try it. Curious about safety? I discuss this more on the Homeopathy page. My most basic recommendation: Do not repeat potencies of 200c or higher frequently. Otherwise, use homeopathic remedies and cell salts. Give them in a way that supports your family’s needs. When you are better or, if after 3 doses you see no changes, stop the remedy and look for another remedy or healing modality. Of course there are situations when a professional’s guidance will be of great value. Discover the power of homeopathic remedies by trying them on your own if this suits you. Then, schedule an appointment with a professional to experience deep healing. Do you have any questions or concerns about using homeopathic remedies? I’d love to hear them. Please comment in one of the boxes below. You can see all of my posts about homeopathy and cell salts by clicking here. As always, I urge you to practice fanatical self-responsibility in your own health and in that of your family. Consult with your physician for medical advice. If you had a preconceived notion of what your child would be like, how he or she would act, look and behave, what you are experiencing may not be want you wanted or expected. Letting go of our “dream child” can be difficult task. Even more difficult may be letting go of the “dream parent” we imagined we would be. Our children will not be parented as we learned to parent (or not to parent) in our childhoods or by observing trends around us. We might find ourselves grieving the loss of the child that never materialized and mourning the parent that we wish to be, but cannot. We know that there is no quick fix that will make our autistic or neurodivergent child into the dream child we envisioned (possibly without realizing that we had some picture in our minds) before they arrived. There is no way to ease into the mode parenting we once imagined. Our grief can blind us. It can prevent us from seeing the unique magnificence of the children we do have. It may keep us from experiencing the greatness of our own love and power. Either all children and parents are perfect – or none of us is. Perhaps in our trying and striving and doing our best, we are enough. Maybe our children are enough, without needing to do anything. Conversely, we might all fall short of the mark of perfection. In either case, feeling miserable and acting inadequate serves none of us. As we reflect on a day, we may sometimes feel that we’ve done well. On other days, we may be overwhelmed by our multitude of failures. I invite you to read this passage (below in blue) and to tap on the suggested points. As you tap, pay attention to what is happening in your body. Notice any memories or feelings that come to the surface. Write them down in a notebook to be tapped on later. In their book, Matrix Reimprinting Using EFT: Rewrite Your Past, Transform Your Future, Karl Dawson and Sasha Allenby suggest that it takes 21 days for new neural connections to form in the brain. Tap on the script that follows for 21 days and notice any changes. Contact a professional Matrix Reimprinting practitioner if you need help. I read about tapping on these words in an article by eaglemoon raes. What don’t you like about yourself? What patterns do you see repeating in your life? How does this affect your parenting – and your happiness? Shirley was devastated when her child, adopted at age 12, left for college and no longer wanted anything to do with the rest of the family. Soon after, Shirley was not accepted into a graduate degree program which she felt would have allowed her to develop her life’s passion. Even though she had a supportive family and a blossoming career, Shirley felt squashed by these rejections. During an EFT session, Shirley realized that she has had a hole in her heart since childhood. Her workaholic father seemed to love his work more than he loved her. While those around her get what they want, Kendra gets more and more frustrated. When she worked in a preschool, the children did not listen to her. Now, her own children seem to ignore her when she speaks or asks for help. She feels unheard and invisible. While tapping, Kendra recognized that from the time she was a little girl, she has felt as if no one heard her or noticed her needs. For others, it appears that all was well in our growing-up years, yet we still encounter these feelings. Whether we know where our feelings originate or the source is a mystery, most of us recognize that there are repeating patterns in our lives. Even if we do not recognize the patterns in our own actions and reactions, we inevitably see them in others. Our perceptions about ourselves and of how life treats us are reflected in the way we speak and in the way we respond to our children’s behaviors. Mothers of autistic children experience more stressful events and have less time for themselves than the average mother. Their levels of maternal cortisol, a hormone released by the adrenal gland in response to stress, were found to be significantly lower than normal. This condition occurs under chronic stress, yielding profiles similar to those of combat soldiers and others who experience constant psychological stress. When we are under stress, we are most likely to revert to old patterns of speaking and acting. Amazingly, we rely heavily on behaviors acquired before the age of seven. Using Matrix Reimprinting, you can rewrite old events and change the emotional hold they have on you. I worked with Shirley and Kendra before I learned Matrix Reimiprinting. While we were able to soften the intensity of those early incidents, I did not have a means to give them tools for changing those painful scenes. Now, when I work with clients with similar situations, I always use Matrix Reimprinting. For Shirley, we would step into an old scene, work with her younger self (ECHO) and allow her to speak with her father if she so chose. For Kendra, we would tap until a specific incident of feeling unheard emerged. We would then work with her ECHO to find a way to feel her power and strength. By working this way, we change habitual behavior patterns. When we feel differently about ourselves, we experience the words and actions of our children differently and we respond in a new, healthy way. It has taken you a lifetime to acquire and cement your current behavior patterns. Even with a brilliant technique like Matrix Reimprinting, you will not change them in one session. You can expect the best results by committing to an on-going program of work with a Matrix Reimprinting practitioner and on your own.